Having learned first-hand how quickly stock-market volatility can destroy wealth, many investors now have an increased awareness of the importance of risk management. This has sparked widespread interest in low volatility equity strategies. Ideally, investors would be able to dynamically adjust the level of risk reduction in their portfolios so as to invest in a conventional core equity strategy during normal market environments, and switch, in a timely manner, to a more defensive portfolio during a crisis. Conventional wisdom suggests that solutions that require market timing are fraught with peril—it cannot be reliably done. We believe it can be done in a different way: by constructing a portfolio based on the level of market volatility instead of return forecasts, it will be able to adapt more readily to changing market conditions. 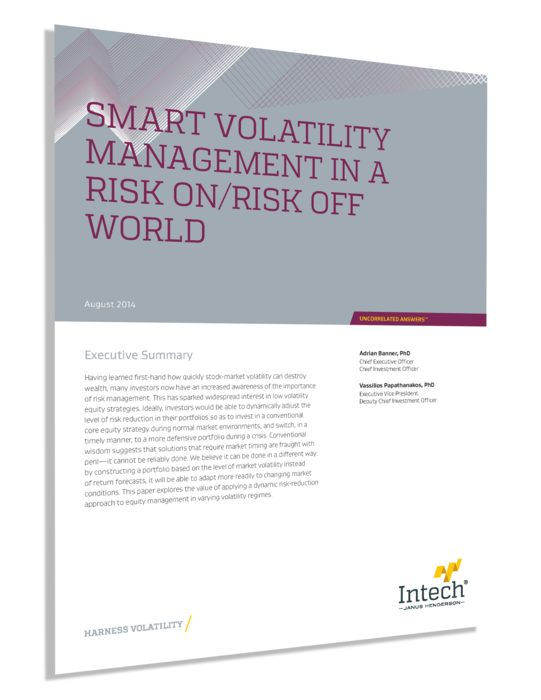 This paper explores the value of applying a dynamic risk-reduction approach to equity management in varying volatility regimes. Given the wide range of market volatility experienced during different market conditions, a dynamic approach to volatility reduction could be vital to properly balance capital preservation with capital appreciation.